The theme for Little Thumbs Up event this month is yoghurt and I see so many yoghurt ice cream submissions that I was itching to make some! Weather here is getting really hot (can get up to 40C!) so a scoop of ice cream, especially a healthy one, can never hurt. I think everyone’s recipe is pretty similar – yoghurt, sweetener and fruits with some using ice cream machine and some don’t. I made a small portion as I was afraid X won’t like the tangy ice cream and used a high fruits to yoghurt ratio. For the sweetener, I used honey to eliminate any presence of crunchy sugar crystals. As my ice cream machine had broken down (super upset over it), I decided to skip the manual churning process and simply throw it into the freezer. And the resulting ice cream is soooo good! 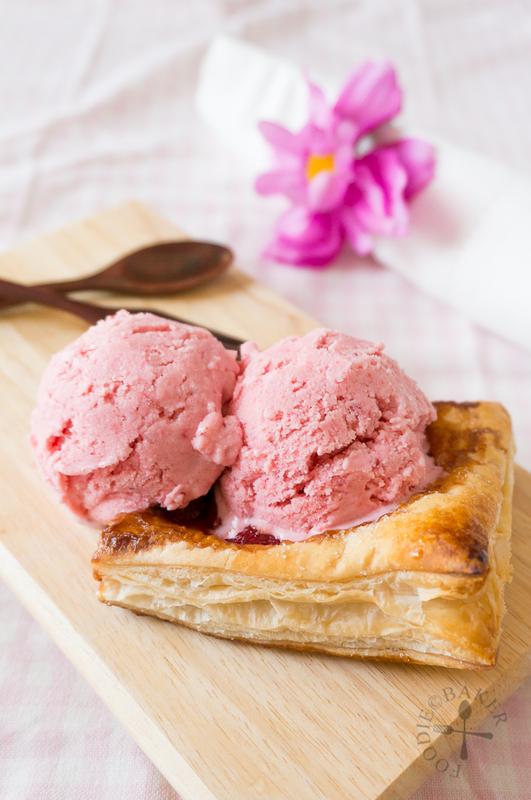 It’s tangy, sweet and so refreshing in this about-to-become-summer heat. The texture may not be as good as churned ice cream but I didn’t taste any huge ice crystals in the ice cream so I guess it’s a blessing. 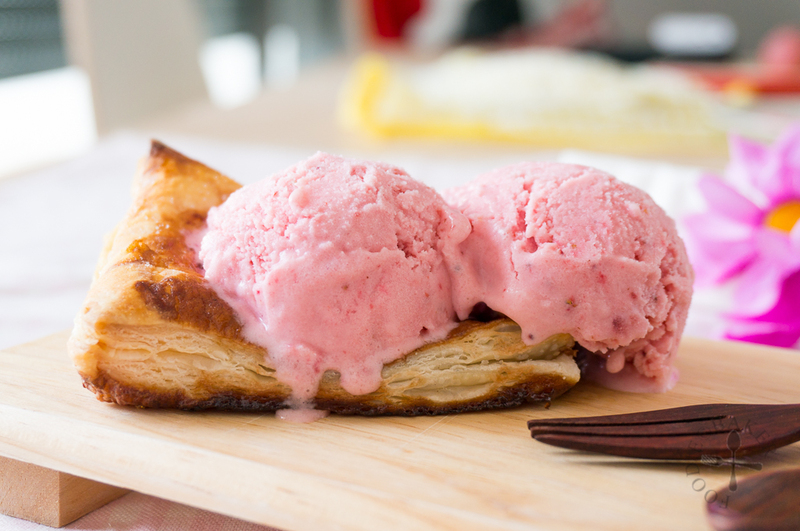 I served it with a piece of flaky puff pastry and oh, too delicious to not have one more scoop! My only disappointment is that I couldn’t capture the ice cream better, they are melting too fast and begging to be eaten, so… oops! 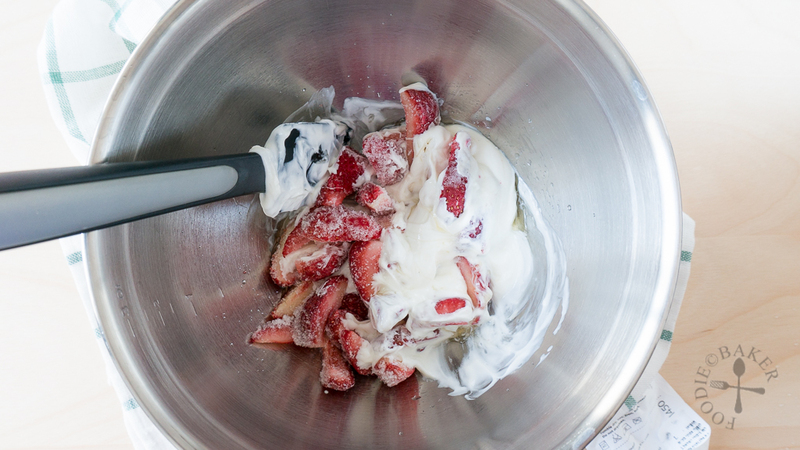 1) Place yoghurt, honey and strawberries in a mixing bowl. 2) Blend with an immersion blender, scrapping the sides and the bottom of the bowl frequently with a rubber spatula. Alternatively, you can use a food processor to blend everything together. 3) Transfer to a container and freeze! 4) Hurry, eat them now! 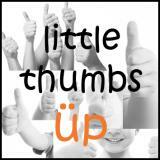 This post is linked to the event Little Thumbs Up May 2015: (YOGURT) organised by Zoe of Bake for Happy Kids and Doreen of My Little Favourite DIY, and hosted by Cheryl of Baking Taitai. The strawberries can be replaced with different kinds of frozen fruits - try other berries, mangoes, bananas, peaches etc, the sky's the limit! 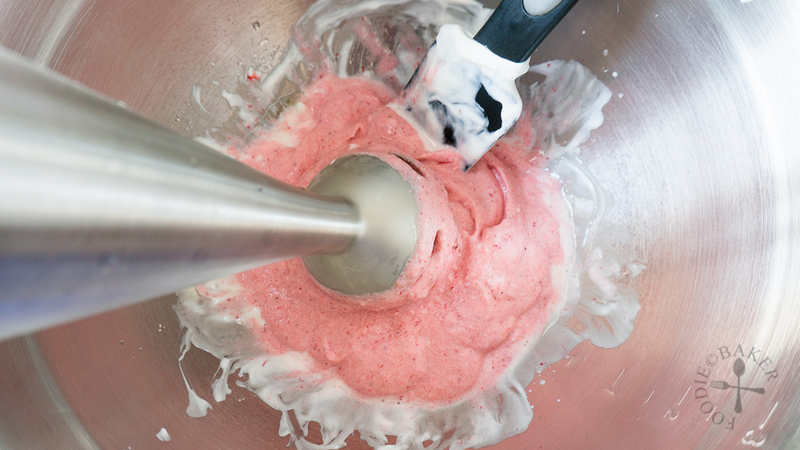 Using an immersion blender, blend all the ingredients together, stopping and stirring frequently with a spatula so that everything is blended together. Alternatively, use a food processor to process all the ingredients together. 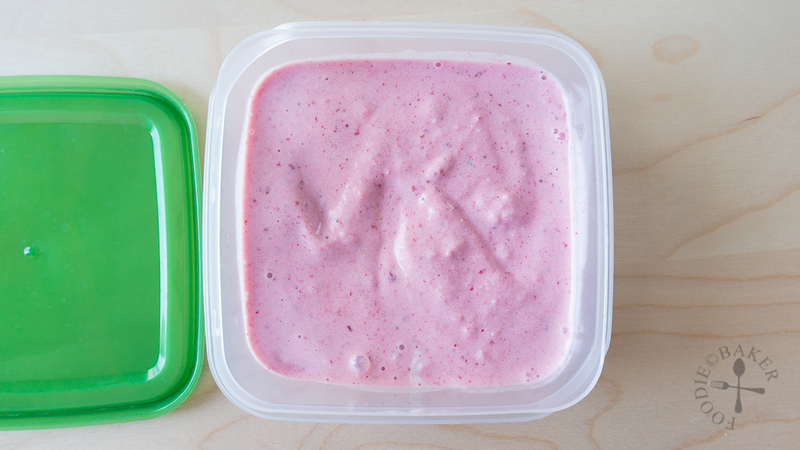 Transfer the ice cream to a container and freeze for at least 4 hours. Preheat oven to 200C / 400F. Sprinkle caster sugar on a baking sheet, lay the puff pastry on top and sprinkle with more caster sugar. Bake for 15 to 20 minutes until puffed and crispy. Let cool before serving with ice cream. 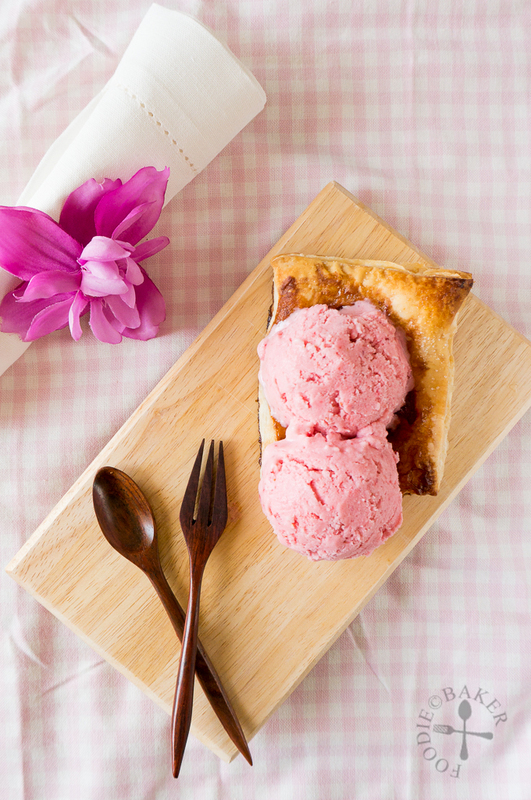 Hi Jasline, the weather is getting really warm and I am yearning to eat ice-cream daily! Yours look so refreshingly good and thanks for sharing it with LTU yogurt event. Haha, but eating ice cream on a cold day can be very shiok too! It looks just luscious on that puff pastry! What a wonderful idea for strawberry season! Thanks Susan! Now that stone fruits season is coming, I can’t wait to freeze some peaches to make peach yoghurt ice cream! Jasline this looks so good I have featured it as a dessert on my latest post! Did you see that? I think in my next assignment I want to be your next door neighbour so I can be your sweet QA analyst! Pinning and Sharing, of course! Hi Bobbi, thank you so much for featuring it! I was too engrossed with your recipe to notice the feature. Oh I can’t wait for you to come over and be my neighbour, we’d have so much fun! Thanks Dedy! I’m sure you will jazz it up restaurant style if you made this! Thank you so much Barbara, it is great to make them now that the weather is getting hotter! Strawberries and Yogurt … this one is definitely going to get two Thumbs up from my son..It is so easy to make and looks so great !! I can’t wait to try a no-churn ice cream. Your strawberry version looks fabulous!!! Thank you Liz! It’s tangy and very refreshing, perfect for summer!